The Quilt-A-Way in Great Falls, Montana, encompasses a bevy of quilting patterns and fabrics, as well as a gift loft and classroom. 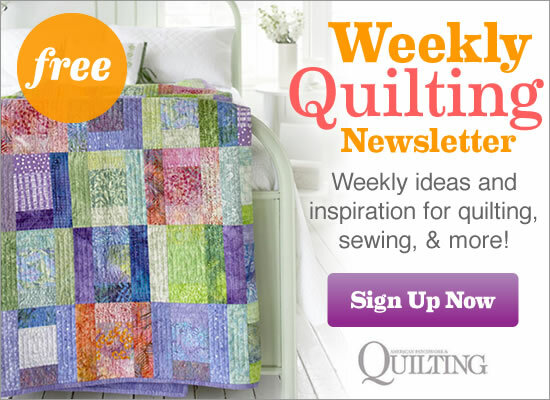 In 1996, The Quilt-A-Way started in Toni Eckart’s garage in Great Falls, Montana, with just 30 bolts of fabric. Over the next few years, it developed into a full-blown retail shop, complete with a gift loft and classroom. Front row, from left: Toni Eckart (owner), Denise Shortridge, and Cathy Koteskey; second row: Mary Luinstra and Shirley Johnson; third row: Colleen Garness and Hazel Rafferty; fourth row: Kathy Bates, Annie Neiffer, and Lynn Nelson; fifth row: Mary DiLello and Diane Brien. Patterns, samples, and kits for aprons, bags, throws, table runners, wall hangings, and more fill the expanse at The Quilt-A-Way. Wooly delights, such as Fall Pleasures table runner and Favorite Seasons 1 pillow by Waltzing with Bears, Victoria Knitting and Sewing Tote by Sue Spargo, and Brownstone Boulevard pillow by Indygo Junction, are samples in The Quilt-A-Way wool room. The Quilt-A-Way carries many nature-inspired patterns, including Waterfalls by Judy Niemeyer. The Quilt-A-Way manager Denise Shortridge designed Rustic Yet Refined for Quilt Sampler Fall/Winter 2010 magazine. Denise secured each flower and leaf appliqué by machine-quilting 1/4-inch inside the edges. She also stitched loops in the flower appliqués, a swirl in each block center, and veins in the leaves. In the tan check border, she quilted a vine-and-leaf motif that mirrors the flowing design of the stem and leaf appliqués. Take Rustic Yet Refined from sweet to sassy with colorful Boutique Batiks from P&B Fabrics. To add to the rainbow effect, quilt tester Laura Boehnke cut two border strips from a blue batik and two from a green batik. She shortened the stem appliqués and used fewer leaves so the vines wouldn’t overtake the smaller 12-block version. Contact The Quilt-A-Way to purchase a copy of the Fall/Winter 2010 issue of Quilt Sampler magazine. Issues are also available at your local quilt shop, on newsstands, and online.